Today I learned an important lesson. When preparing bento, make sure to wash your boxes after eating, or at the very least, soon after you get home. Because if you don’t, you might have very big problems…like life evolving inside them! Just kidding! It’s just another case of my lunch looking back at me, this time as a non-descript pair of leering eyeballs. A pair of eyeballs—with ears! *cackles* Today’s lunch features pork and potatoes stewed in tomatoes (again, again, pork & potatoes, stewed in tomatoes, pork & potatoes, stewed in tomatoes!). No recipe since I have no idea how my mom cooked it other than it being pork, potatoes and tomatoes (heehee) stewed in a heavy pot. To the right, I have orange wedges. For some reason, the flesh was really dark. When I opened it, I quickly asked my mom whether she bought blood oranges but she knows it was just normal oranges. The redness wasn’t quite captured here but you have to agree, it’s much brighter than your usual sunkist and valencias. And the centerpiece, two eyeballs! 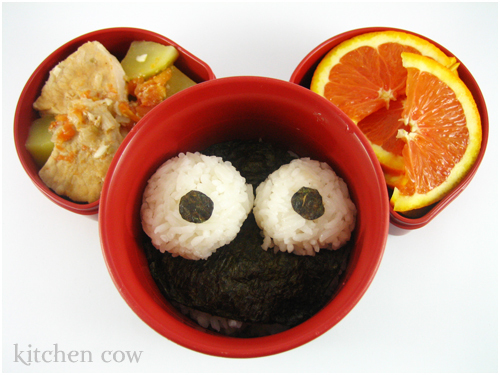 I mean, two onigiri masquerading as eyeballs. These were stuffed with salmon cream cheese and dotted with nori to make the pupil. It’s resting on a bed of more rice that’s covered with a sheet of nori so it’ll look like some unidentified creature / darkness / mold / whatever you want it to be. Still, even if it were a false alarm, remember folks! Wash your bento boxes! Thanks. About the stew though, it was filling but it’s far from light. It just looks that way I guess. ^_^;; Or maybe I just ate too much. Ooomph. Which reminds me…eep. I don’t think I’ve washed it yet! That is so cute. I couldn’t help but widen my own eyes while looking into those salmon cream-cheese filled beauties. How do you come up with these great ideas?! Galing talaga! Your bentos always catch me by surprise! last night I was running out of food container/bento to use. I checked the ref and found one that had peeled oranges weeks ago. when I opened it, there were organisms sprouted from the orange. i was amazed and showed it to my husband. But then, he said I should not inhale the spores as it may be dangerous. Oh well.. my story of bento stored in fridge for a long time.